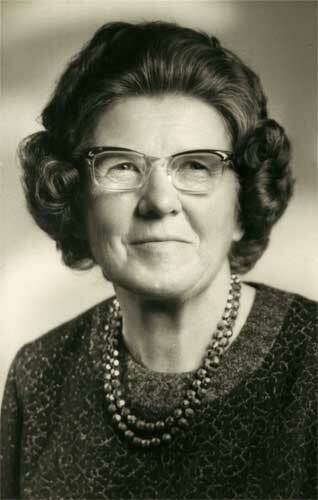 Beatrice Ena Watkins, their eldest daughter, was born on 13 October 1907 in Te Aroha. In 1911 the family moved to Mercer where Percy operated a quarry. In 1918 they moved again, this time to a fine old homestead on the Great South Road in Papatoetoe. this was the time of the influenza epidemic so the family placed itself in quarantine in their own house. When Sam Smith brought food to the house it was hauled up in a basket to a top floor window. Sam milked the cows, refused to come in, drank whisky three times a day as medicine, and never caught the flu. The first Catholic Mass in the district was celebrated in this homestead, and Ena was present. In 1922, Butler's Garage was established in front of the house. The Great South Road had a loose metal surface at that time. It was pioneering motoring days. Ena attended Papatoetoe Primary School and Otahuhu Convent. At Brains Commercial College she qualified in book keeping and shorthand typing, in spite of her studies being interrupted so that she could nurse her mother. Then she worked at WS Laurie and Co. Seed Merchants in Fanshaw Street, and from there moved to the solicitors Kavanagh de Cough and Boylen. As Mr de Cough was the French Consul, letters had to be typed in French, even though Ena did not understand the language. Her career was cut short when her mother insisted that she should leave her job to cook and care for the homestead and the many visitors. Her mother was then able to devote herself to tending the pumps at the garage. Ena married Vivian Alphonso Watkins on Boxing Day 1931 at St. Benedict's Church, Newton. It was the middle of the Depression. For their honeymoon they went to Opotiki and Wairoa in their Baby Austin Seven. The trip cost fifty five pounds. The roads were single lane and when they met another car it was often necessary to back up to the nearest passing bay. Ena and Vivian bought the section at 238 Great South Road next to Butler's Garage from Roy Gubb, and Viv and Byron built the house. Clive was born in 1935, and Tony in 1938. Viv's work as a logging contractor for the Leyland O'Brien Timber Company kept him away from Papatoetoe, and Ena often went with him to the work camps to cook for the men. She was equally at home with the quality of Royal Doulton china and the friendliness of the enamel mug. Ena's beautifully written letters and kindly phone calls held together a wide network of friends and family and her integrity enhanced her role as a confidante. She was tenacious, fearless and skilful in fighting for justice, making rather than following history. The kauri tree at the back of her property became one of the first protected trees in New Zealand. She died at Papatoetoe on 27 January 1989. First published in "Cameos of Papatoetoe Women"